With the Definitive Agreement in place, Einstein and Jefferson will move forward in seeking all necessary state and federal regulatory clearances. A merged clinical academic enterprise would host the largest number of residents and fellows in the Greater Philadelphia region, making Jefferson uniquely positioned to educate the healthcare professionals of tomorrow with a multi-hospital clinical rotation unlike any other. The merger would also bring together nationally recognized MossRehab and Magee Rehabilitation, two of U.S. News & World Report's top-ranked rehabilitation hospitals. "This is a critical step forward for the students and patients of both institutions and equally as important for our community as a whole," said Stephen K. Klasko, MD, MBA, President of Thomas Jefferson University and CEO of Jefferson Health. "Our joint planning in recent months has reinforced how much Jefferson and Einstein share the values dedicated to re-imagining the future of health, education and discovery. As we move forward, we will be transparent and committed to the community in making this partnership work." 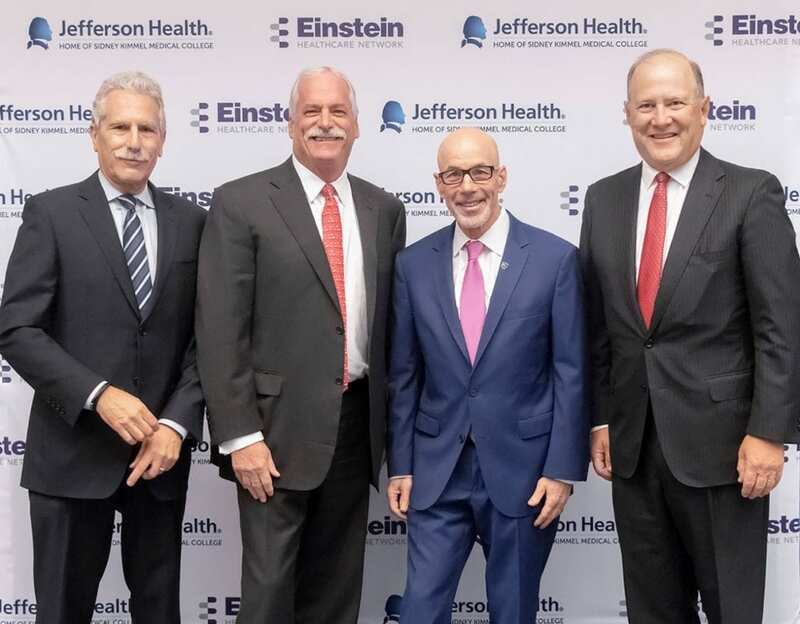 "Today, the signing of the Definitive Agreement between Einstein and Jefferson brings us one step closer to merging into a single healthcare system," said Barry R. Freedman, President and Chief Executive Officer of Einstein Healthcare Network. "Both organizations have a long and storied history in this region and we are excited to bring together our shared vision for delivering high-quality, affordable healthcare and providing exceptional education and training to the physicians of tomorrow." The Definitive Agreement extends the shared governance model that was established with the integration of previous healthcare organizations when merging with Jefferson. The agreement details that Einstein will designate an equal number of members to the expanded Thomas Jefferson University board, and will have the same representation as Abington – Jefferson Health, Jefferson Health – Northeast and Jefferson Health – New Jersey. Following the integration, Freedman will remain as President and Chief Executive Officer of Einstein while adding the role of Executive Vice President at Jefferson Health. In this new role, Freedman will help guide the transition and integration efforts of Einstein into the Jefferson system while exploring new strategic initiatives for Jefferson. Klasko will remain the Chief Executive officer of Jefferson Health with Bruce Meyer, MD, MBA as President of the clinical enterprise. The Definitive Agreement comes after Einstein and Jefferson signed a non-binding Letter of Intent (LOI) in March.